The 43.5 metre motor yacht Praxis, listed for sale by Joe Foggia and Ed Sacks at Northrop & Johnson, has received a $1,910,000 price reduction. Designed by De Voogt, she was built in steel and aluminium by Dutch yard Feadship to Bureau Veritas class and delivered in 1987 with several refits since. Accommodation is for up to 12 guests in five cabins decorated in shades of pale cream and light blue and consisting of a master suite, two doubles and two twins, each with a Pullman berth, and all cabins have en-suite bathroom facilities. The main saloon is panelled in a warm shade of wood and offers comfortable seating on white settees and armchairs with blue piping and there is a dining area aft with seating for up to ten guests. The aft deck is ideal for al fresco entertaining and dining, featuring built-in upholstered bench seating and wicker chairs surrounding a large coffee table. Up on the sun deck of this yacht for sale is a sun worshipper’s paradise, comprising several seating and conversation areas along with sun loungers, a bar, new Jacuzzi and sun umbrellas. Twin 775hp Caterpillar engines give her a range of up to 3,500 nautical miles and she is fitted with Quantum zero speed stabilisers. Her 2013 refit was extensive, involving a full repaint job, a fresh interior décor, updated audio/visual systems and upgrades to the mechanical equipment. In addition, the sun deck and sky lounge were extended by 3.5 metres with great care being taken to maintain her classic looks. She received further upgrades in 2017 at the Derecktor yard in Florida. 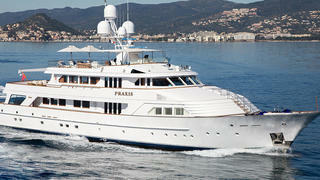 Lying in South Florida, Praxis is now asking $9,990,000.